Japanese used piano | Union Gakki Co., Ltd.
We support better music life for music lovers in all over the world. In case you are thinking that you want to get the Japan-made used piano, please contact us-”UNION GAKKI CO., LTD”! We are sure that we are preparing many attractive suggestions to you in terms of its type, quality and price. We are now doing worldwide business with our customers from about 50 countries and making our best so that we could meet your satisfaction and expand our business network more widely. We have confidence about the quality! We put our high- technology and our hottest passion into the reused pianos. 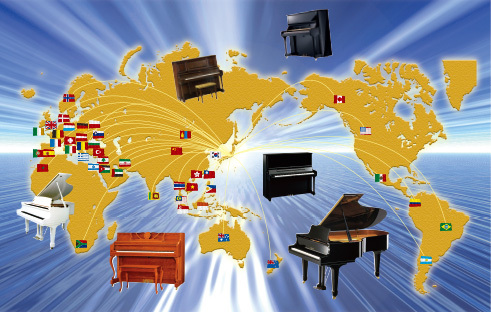 We are the company who has one of the largest stock of secondhand pianos. You can choose your favorite pianos from them. Our accumulated experience will enable meaningful suggestions. Support cordially to everyone as your partner in Japan. ‘UNION GAKKI CO.,LTD’ has established in 1973, and our unchanging basic business policy since then is ‘Innovation’ and ‘commitment’ so that we could faithfully meet various demands from the society. Having rich ideas and being energetic for the reformation and innovation, we keep on developing our original techniques to gain even more trust as a brand from our customers. To prove the achievement of the techniques, we registered the trademarks for every particular item. We are committed to keeping promises on “result is everything” principle. In order to accomplish this vision, we think setting a deadline is the most basic of the basics. Copyright © 2015 UNIONGAKKI CO., LTD. All Right Reserved.